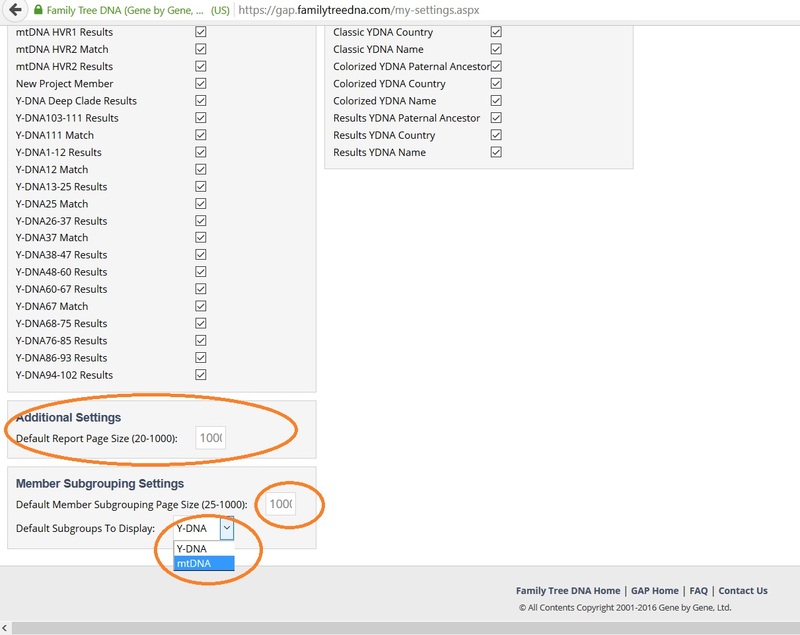 This page is meant for FTDNA project administrators. Here you get a few tips and tricks. Make sure you change the settings to fit your project and needs. You might not want to have email notifications about everything. 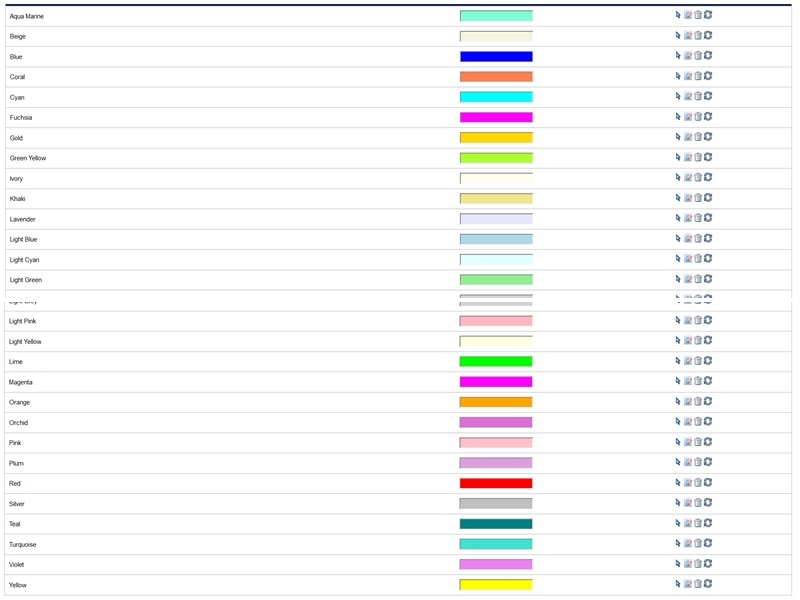 However: Take some time to see how much email it generates before you uncheck any boxes. 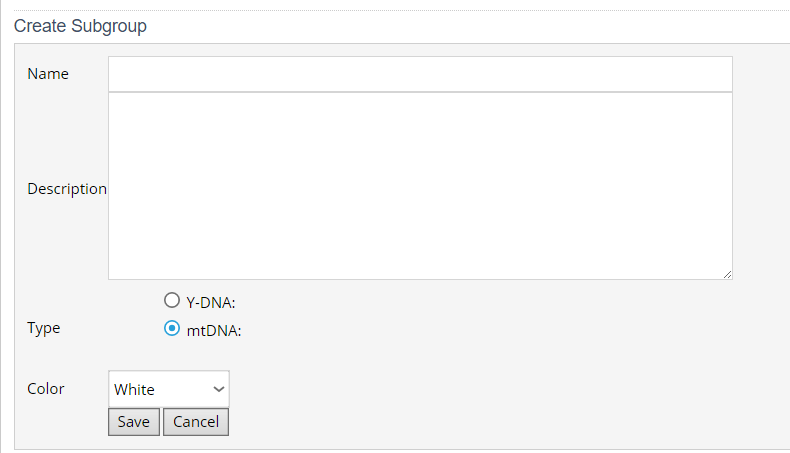 In general: For Y-DNA projects you can remove mtDNA notifications, and vice versa. The column on the right decides what your GAP page will display. I recommend keeping all boxes checked. Default report page and subgrouping page is most useful if set to max (1000), so you see the whole results lists at once. This provided your internet speed and computer is fast enough. 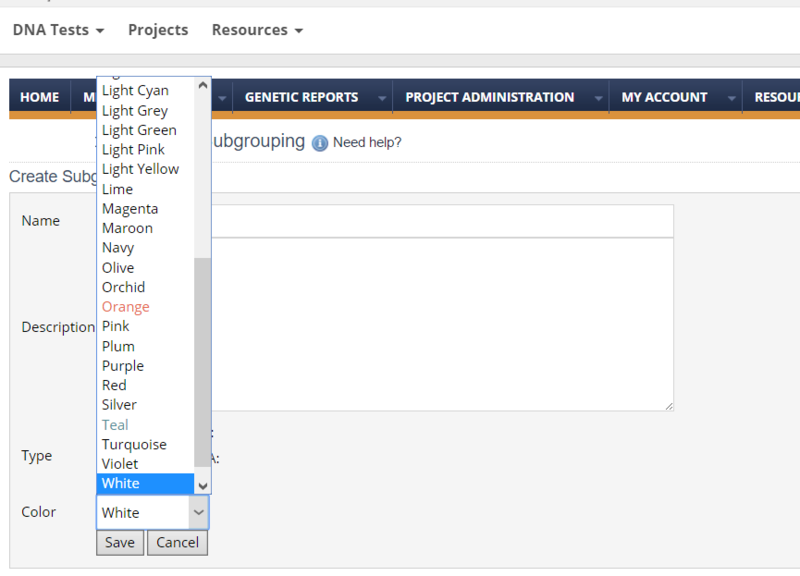 For mtDNA projects it is advised to change default subgroups to display from Y-DNA to mtDNA. You find this under Project Administration in GAP. This is your main tool as an administrator. Y-DNA and mtDNA have a list of categories each. Open Project Admin > Member Subgrouping in another tab. Click the small arrow in the right column for each category to enter the category. 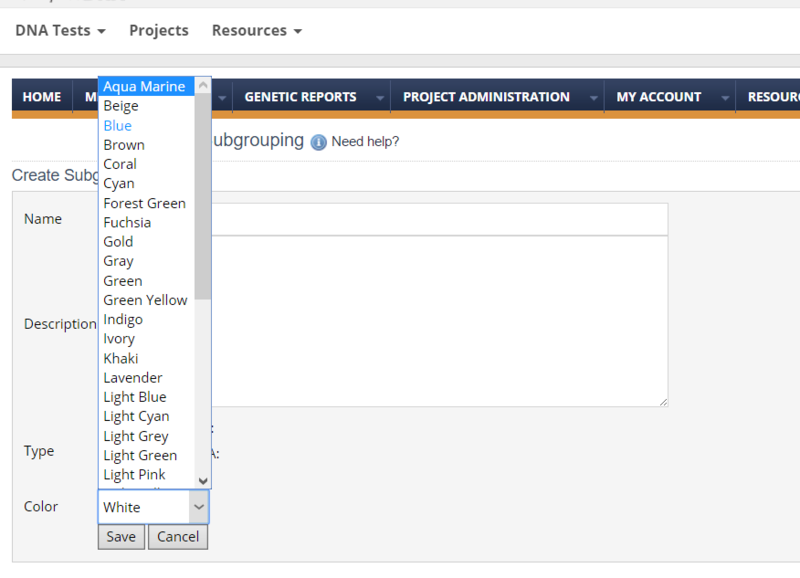 Any ungrouped kit with results will be listed to the right: click Add to add the kit to the correct subgroup. If you need to move a kit from one group to another, then first enter the category the kit is in. Scroll down to the kit number in the left column of category members (listed alphanumerically) and then remove the kit by clicking «Remove». That will move the kit to Ungrouped. If there is no subgroup (category) made for the actual result, you might need to create a new one. If you are a new co-admin, discuss with the main admins first. When you create a new category, you should choose a color for the category headline. When you have created groups, then click the small arrow – select – to be able to add your project members to the new category. If you wish to edit the group name, click the «note» symbol. If you wish to delete the category, click the bin symbol. Here you find each member’s kit number, email address and – important – the possibility to make personal notes. You can see whether the Release form is signed, and if the person is in the wrong project, you can remove him/her by clicking the bin. You then have to write an explanation. Above the members list, you find a field for «page size». If your project has more than 1000 members, then change the number so that you can see the full members list on one page. Use browser search to find specific names or kit numbers. As you get used to GAP you will find your own preferences in how to work with all these. Det som legges inn under gruppebeskrivelsen kommer fram på første side i About. Her fins sidene der man kan legge inn informasjon som kommer fram under Background, News, Results. Ingen kits kategoriseres i Y- eller mt-gruppene med mindre de har ført inn eldste kjente ane etter våre regler med fullt navn, gårdnavn, år, sted og fylkeskode. NB: Ingen tegnsetting annet enn bindestrek mellom år for født og død. Kits som ikke har navn, år og sted oppført etter vårt format skal legges i rødliste ZZZ, og kontaktes via epost om at de må føre inn korrekt. Administratorer kan redigere til korrekt format dersom vi er satt til Advanced tilgang. Lokalprosjektene er kun for dem med Y og eller mt-resultater – ikke bare FF-test. Har de ikke Y eller mt fra området, eller med sterk tilknytning til området, skal de fjernes. Har de Y fra området og mt fra et annet sted legges mt i ZZZ-gruppe. Tilsvarende om mt er fra området og Y fra et annet sted. Haplogruppene har faste farger i Norgesprosjektet og lokalprosjektene. Se hovedprosjektet for hvordan det er gjort, og spør de erfarne adminstratorene.